After graduating from Gujarat University where he earned his Bachelor of Medicine (M.B.B.S) and Bachelor of Surgery, Master of Surgery (M.S. ), and Magister Chirurgiae (M.Ch.) in Plastic Surgery and Burns as a gold medalist. He obtained his certification in basic microsurgical skills at Ganga Hospital Coimbatore and did his Fellowship in Aesthetic surgery & Cosmetic Laser Surgery, from Mumbai. He also went for Advanced Fellowship in Cosmetic Surgery & Laser under renowned Brazilian Plastic surgeon Dr Ruth Graf and Dr Sherrell J. Aston in USA. He also trained under Dr Michael Beehner who is a one of the pioneers in the field of Hair Transplant worldwide. Dr. Mayank has headed a hair transplant centre as a consultant in Mumbai and has successfully performed over 1500 hair transplants on patients from India and abroad. 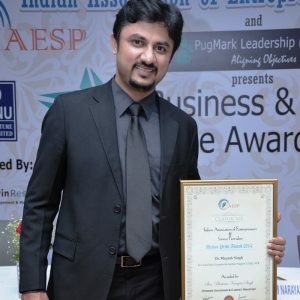 Currently he is the Director of Radiance Cosmedic Centre in New Delhi, Greater Kailash and Janak Puri. He was attached with various aesthetic clinics in delhi NCR as consultant plastic , cosmetic and hair transplant surgeon for past several years and he also gave his expert services to the poor patients at ESI medical college ,hospital and research centre in the past. 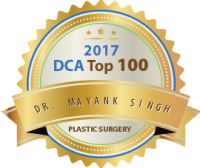 Dr Mayank Singh has given many presentations in State & National conferences and has published various academic papers in Regional, National & International Medical Journals. He regularly participates in Conferences & CME to update his knowledge and surgical skills. 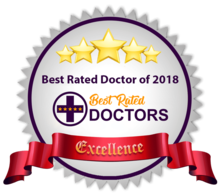 He is a certified member of Association of Plastic Surgeons of India, Indian Association of Aesthetic Plastic Surgery and Indian Association of Hair Restoration Surgeons and Asian association of hair restoration surgeons.